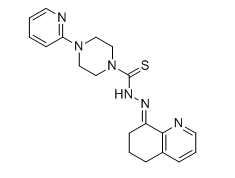 Nutlin 3 is a commercial available p53-MDM2 inhibitor, with Ki of 90 nM. PK11007 is a p53 targeting compound, has anti-tumor activities through activation of unstable p53. Pifithrin-β is a potent p53 inhibitor with an IC50 of 23 μM. CP 31398 dihydrochloride is a potent activator of p53 with maximum tolerated dose of 400 ppm. CBL0137 is a metabolically stable curaxin that activates p53 with an EC50 value of 0.37 μM and inhibits NF-κB with an EC50 of 0.47 μM. Prima-1 is an inhibitor of the growth of cell lines derived from various human tumor types in a mutant p53-dependent manner. COTI-2 is a small molecule candidate anti-cancer drug which can convert mutant p53 to wild-type conformation. NSC319726 is a mutant p53R175 reactivator; inhibits growth of fibroblasts expressing the p53R175 mutation (IC50 = 8 nM); shows no inhibition for p53 wild-type cells. 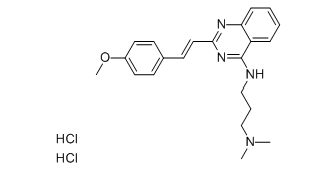 Kevetrin ( thioureidobutyronitrile), is a water-soluble, small molecule and activator of the tumor suppressor protein p53, with potential antineoplastic activity. FL118 is an inhibitor of human survivin expression, activating tumor suppressor p53 as a novel MOA in p53 wild-type cancer cells.